"I opened an envelope from a second grade teacher who said she saw The First Forest as primarily a story of relationships. She told me that she had decided to use the story to introduce a class discussion about how we get along with each other — and sometimes fail to get along. She said she shared the story with her students, then asked them to retell the story in their own words as she wrote their words. She also invited the students to share their thoughts and feelings about the story and recorded their comments. • "Never be selfish and then you'll have a beautiful world." — K.S. • "Don't be selfish. Learn to use your knowledge wisely. There is no need to fight. You can work it out. Share your brotherhood with friends." — S.S.
• "Respect the feelings of others." — A.Z. • "Fighting will never solve anything." — D.S. • "Never be selfish and keep joy within you." — S.R. • "When you need to be punished for something you did wrong, don't ever think it's because they don't love you. It's because they love you so much and want you to learn." — E.P. • "Even if other people don't care, you should care." — K.K. •"Always help the people who get hurt." — P.H. • "Don't be a know-it-all or a big shot because this hurts others' feelings. Instead try sometimes to help others." — C.E. • "Learn to talk out your problems. Keep the peace." — K.J. •"If you get down, just keep hope and you'll probably be okay." — L.H. • "You should always keep pretty thoughts and not ugly thoughts in your mind." — S.A.
• "Just because you're big doesn't mean you are the best." — N.L. • "Don't be jealous because you didn't get something someone else did. There's always something special about yourself." — D.L. • "Always use a little imagination in your life and wonder!" — K.C. "I hope that my children will read it to their children." Special thanks to Kathie Ayres, Scholarship Administrator for the Community Foundation of Northern Illinois, for sharing the following essay by a scholarship applicant. Applicants are asked to "Tell about a book that affected your life." This is a student's response. "The First Forest went with me everywhere . 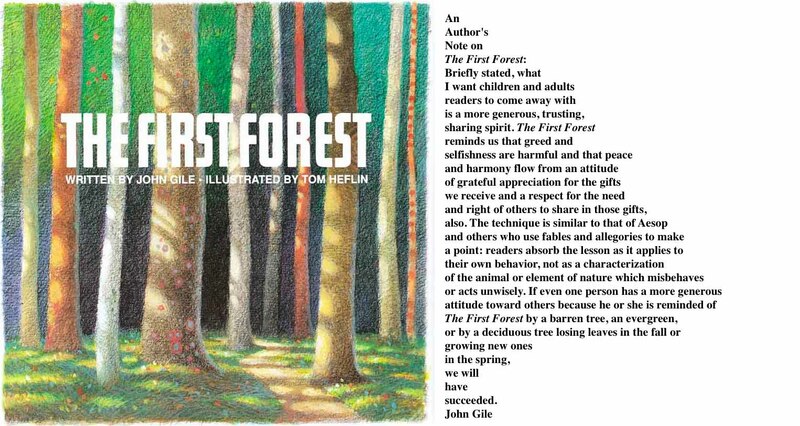 . ."
A book that really affected my life is The First Forest by John Gile. The first time I heard the story was when I was in the second grade and the book was read by Mr. Gile himself during a "Read! Read! Read!" program at school. My mother bought a copy as a gift for my sister and me and we had it signed by the author. I thought it was so cool to have this book. I wanted it read to me every night. The First Forest went with me everywhere. I played school teacher a lot and would always read it to my pretend students because I liked the way it rhymed and because it had such awesome pictures. The most important thing about the book, though, isn't the pictures. It's the story's lesson. It taught me that nothing good ever comes from selfishness. It taught me that when people have generous attitudes and are peaceful, their lives are rewarded and praised and they are trusted throughout life . . .
"They are always there for me, no matter what . . ."
The author notes at the end of the book that if at least one person has a more generous attitude toward others because he or she reads The First Forest, he will have succeeded. I know he succeeded because here I am at 18 with the book displayed on a shelf in my room. I think of myself as a tree in the forest and my parents as the tree maker in the story. I know I don't always do the right things, but they are always there for me, no matter what, and they always care for me, just like the tree maker. The First Forest has affected my life and I will keep it forever. I hope that my children in the future will read it to their children, for the book teaches values everyone needs to learn. "A woman came up to me at a book store with six copies of The First Forest in her hands and asked me to sign them for her. It was the holiday season, and I asked if she wanted me to inscribe a holiday greeting in the books for each person. "She told me the books were not holiday gifts, that The First Forest had been read at the nursing home where she works and a woman being cared for there, an elderly woman who was not expected to live until the holidays, had decided this was the message she wanted to leave behind with certain friends who had been very important in her life. 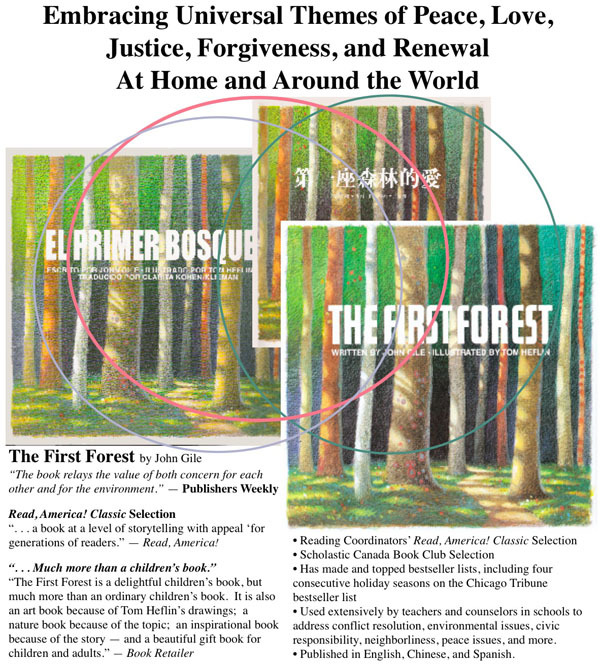 Ask for The First Forest at your favorite bookstore.